Rob Schnapf exudes a contentment and inner joy that comes from 20 years being right where he belongs. Producer, engineer, mixer, and musician currently stationed in his MANT studio next door to Kingsize Sound Labs in L.A., Schnapf has earned this satisfaction through his acclaimed work with Beck, Mavis Staples, Elliott Smith, the Vines, the Foo Fighters, Richard Thompson, Moby, Guided By Voices, and Tokyo Police Club, as well as his co-production with Booker T. Jones of Jones' Potato Hole and The Road From Memphis, both Grammy-winning albums. Schnapf's more recent credits include projects by Kurt Vile (b'lieve i'm going down), Cass McCombs (Mangy Love) the Bronx (V), Joyce Manor (Cody), and Richard Edwards (Lemon Cotton Candy Sunset). Schnapf spent much of the '90s and early 2000s working out of Sunset Sound before transitioning to his own MANT studios, logging long sessions for big label projects. These days, he has more artistic and budgetary control over his work than ever, but is still motivated most by his relationship with the music and the good people who make it. "I'm not a big fan of the transactional relationship, so I like working on stuff where I like the people, or I'm moved by the music," he says. "One of the awesome things about this job is that you get to have these intimate relationships with people that are based on the art." These relationships are something of a metaphor for the kind of music Rob likes to build-music that is built from the ground up, in a creative, comfortable zone in which the music can "hit the mic, come through the glass, and come out the speakers...a real thing," he says. "You have to be present: Don't think, close your eyes, do it." Schnapf doesn't have a tape machine anymore, but mixes through a console, always approaching a sound head on, having a goal on the front end. "Make the sound and commit to it." That's where the Manley Reference Silver tube mic comes in. "I have two feelings," Schnapf explains. "One feeling is, it ain't about the gear. The other feeling is, man, sometimes gear is inspiring." And the Manley Reference Silver, which is modeled after the legendary Sony C-37A, has indeed inspired Schnapf. While he doesn't believe one singular mic works for every artist, the Manley has stood apart from the crowd time and time again when he was seeking out the perfect mic to capture some pretty exceptional voices. 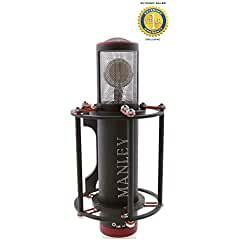 The Manley mic is "smoky and silky and beautiful, man," Schnapf explains. "That's right up my alley. I was doing a record with Cat Power, and we used it a ton. It had this sort of smoky, sultry kind of quality. Kind of, I don't want to say 'old,' but there was just this...I can't put words to it. Anyway, that mic worked. It sounded so good on her." Schnapf also used the Manley in his recent collaboration with Nashville indie band Escondido. "We used it on Jessica [Maros] and also used it on upright piano, and trumpet." "Yeah, that's a special mic."